"Definitely Maybe" begins with a statement of aspiration, as Liam Gallagher sneers that "tonight, I'm a rock & roll star" -- the words of a bedsit dreamer hoping he'd break out of those four walls and find something greater. This dream echoes throughout Oasis' debut, a record which takes the dreams of its listeners every bit as seriously as those of its creators. Deleted Austrian special limited edition double CD set includes the 11-track CD album plus bonus 'Whatever' 1-track picture CD. 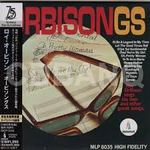 Originally released in 1965, Orbisongs was the last album recorded by Roy Orbison for the Monument label before he signed with MGM Records. Vinyl Replica Paper Sleeve with 9 Bonus Tracks. The cover of Le Orme's Ad Gloriam is about as psychedelic as it is possible to be or imagine; it is a swirl of color and a collage of pop-art images, featuring drawings (and photos) of the band members and various op-art images of well-endowed women scattered amid butterflies and geometric shapes. The music is also, indeed, psychedelic,and runs the gamut from pleasant, Beatles-influenced ballads to more spaced-out interludes emphasizing Tagliapietra's flute and Smeraldi's lead guitar. "Mita Mita" sounds vaguely like the Who's "I Can't Reach You," while "Fiori di Giglio" is vaguely reminiscent of "Penny Lane," and "Non So Restare Solo" is a very distant relative to "Being for the Benefit of Mr. Kite." The most extensive Ozzy collection ever, the career-spanning four-disc box set Prince of Darkness comprises 50 tracks, 15 of them previously unreleased -- 10 are newly recorded cover versions of some of Ozzy's favorite tunes. The box features deluxe packaging, including a 60-page, full-color booklet with rare photos, memorabilia, liner notes, and track-by-track notes. Still Sealed!